278 pages | 10 B/W Illus. Constitutions and the Commons looks at a critical but little examined issue of the degree to which the federal constitution of a nation contributes toward or limits the ability of the national government to manage its domestic natural resources. Furthermore it considers how far the constitution facilitates the binding of constituent states, provinces or subnational units to honor the conditions of international environmental treaties. While the main focus is on the US, there is also detailed coverage of other nations such as Australia, Brazil, India, and Russia. 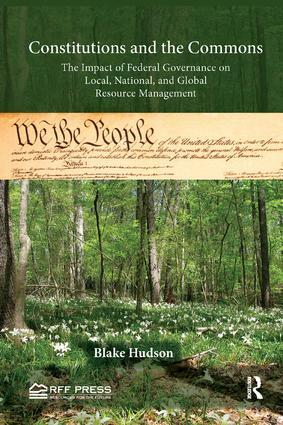 After introducing the role of constitutions in establishing the legal framework for environmental management in federal systems, the author presents a continuum of constitutionally driven natural resource management scenarios, from local to national, and then to global governance. These sections describe how subnational governance in federal systems may take on the characteristics of a commons – with all the attendant tragedies – in the absence of sufficient national constitutional authority. In turn, sufficient national constitutional authority over natural resources also allows these nations to more effectively engage in efforts to manage the global commons, as these nations would be unconstrained by subnational units of government during international negotiations. It is thus shown that national governments in federal systems are at the center of a constitutional 'nested governance commons,' with lower levels of government potentially acting as rational herders on the national commons and national governments potentially acting as rational herders on the global commons. National governments in federal systems are therefore crucial to establishing sustainable management of resources across scales. The book concludes by discussing how federal systems without sufficient national constitutional authority over resources may be strengthened by adopting the approach of federal constitutions that facilitate more robust national level inputs into natural resources management, facilitating national minimum standards as a form of "Fail-safe Federalism" that subnational governments may supplement with discretion to preserve important values of federalism. Blake Hudson is Associate Professor at both the Paul M. Hebert Law Center and the School of the Coast and Environment, Louisiana State University, USA.